ENGINE The new DOHC (Double Overhead Camshaft) engine of the 350 XC-F features a completely new construction in order to make it even more compact and powerful than before. Fitted with the latest electronic fuel injection system, it has a very wide and usable power spread while still delivering high performance. The new design has made the engine 20 mm shorter than before, while reducing the weight by 2 lbs. CYLINDER HEAD The new cylinder head features an improved combustion chamber geometry, two overhead camshafts with a friction-optimized super-fine surface, new finger followers with a 30 % harder DLC coating and high-flow ports. In conjunction with new valve springs and retainers for the four lightweight titanium valves (intake 36.3 mm, exhaust 29.1 mm) the flow rate has been maximized for an optimal power band with more performance across the entire range, which peaks at 13,400 rpm. The peak performance now is at 58 hp. CYLINDER AND PISTON In the redesigned and shorter cylinder, with a bore of 88 mm, works a weight-reduced forged bridged box-type piston made by CP. Its new piston crown geometry is adapted to the new high-compression combustion chamber and stands out with its extra rigid structure and low weight. Thanks to the low oscillating masses, the engine is extremely lively. The compression ratio is14:1. 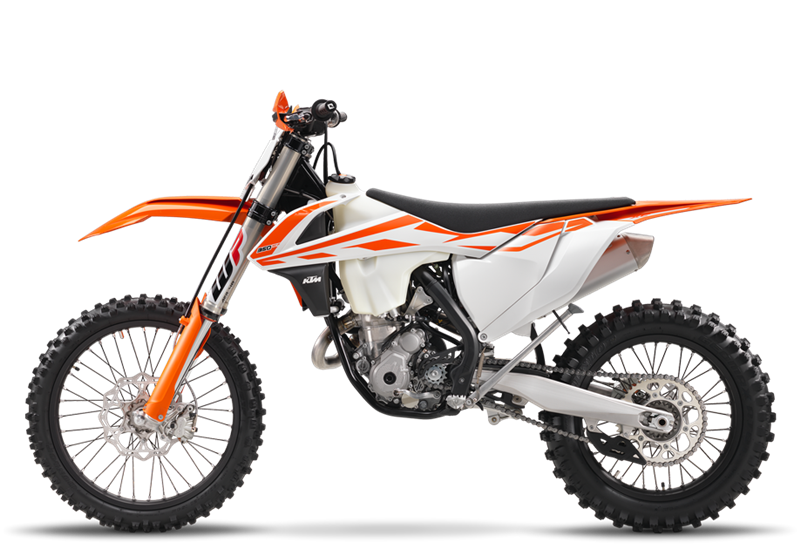 CRANKSHAFT The new 350 XC-F's crankshaft is lighter and features a stiffer design than before. It utilizes a shorter connecting rod, contributing to the compact and light engine with a snappy power delivery. This design is a major prerequisite for the extremely high engine speed levels and the unrivalled maximum power of the 350 cm³ engine. Not only that, it enhances the engine's durability, allowing long crankshaft service intervals. ELECTRIC STARTER The new 350 XC-F is fitted with an electric starter as standard, which a clear advantage when it comes to crunch time in the heat of battle. A new starter motor made by Mitsuba (modified for easy disassembly) and a weight reduced starter drive guarantees more efficient and reliable starting. 350 SX-F ENGINE CASES AND COVERS The completely new design of the die-cast engine cases allowed for a much more centralized shaft configuration, raising the crankshaft by 6 mm closer to the bike's center of gravity. Newly designed engine covers made of magnesium feature an advanced surface structure, which reduce the wear caused by the rider's boots. COUNTER BALANCE SHAFT In order to balance the high-revving engine, the new 350 XC-F engine uses a multifunctional counter balance shaft driving the water pump and timing chain. It features new sprockets fitted to the new timing chain. BATTERY AND WIRING HARNESS As in the past, all new XC-F engines are fitted with the proven electric starter - a unique KTM feature and a major benefit at all levels of motocross racing. For 2017 the XC-F range fits a super compact and lightweight lithium-ion starter battery, providing safe starting of the engine while reducing the weight significantly. FRAME The new frame design provides approximately 20 % higher torsional rigidity and 30 % less longitudinal stiffness, with newly designed engine stays for less vibration. This increased flexibility results in better absorption of the energy created from the front and rear wheel loads supporting the suspension for more comfort and less rider fatigue. A 0.4° steeper steering angle and a 10 mm shorter wheel base contribute to better handling and last but not least it´s lighter than the previous model. 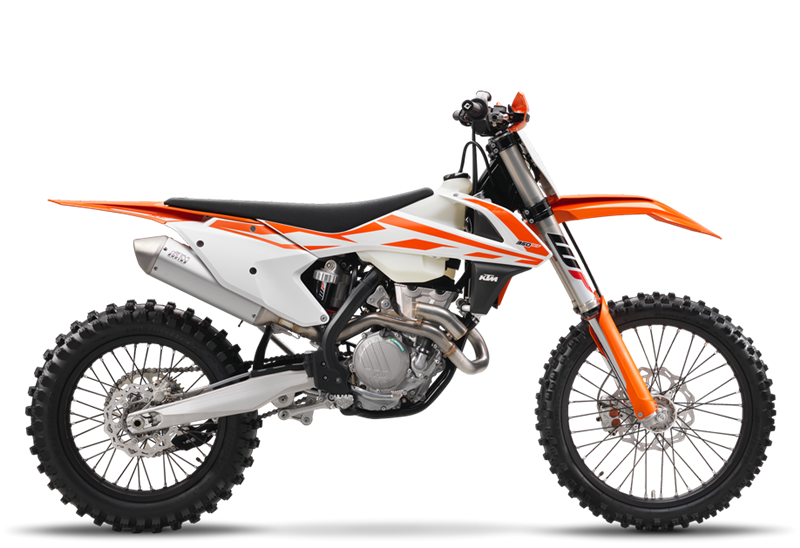 FORKS The KTM XC models feature the advanced WP AER 48 for 2017. The AER 48 fork has been specifically designed and adapted for off-road riding conditions in the USA. WEIGHT REDUCTION The main target for the KTM engineers when developing the new XC-F generation was a massive weight reduction in conjunction with improved handling. The resulting loss of nearly 7 lbs is outstanding, making the new KTM models the lightest bikes on the track, even with electric starting.